Morris Motors Limited was a British privately owned motor vehicle manufacturing company formed in 1919 to take over the assets of William Morris's WRM Motors Limited and continue production of the same vehicles. By 1926 its production represented 42 per cent of British car manufacture—a remarkable expansion rate attributed to William Morris's practice of buying in major as well as minor components and assembling them in his own factory. Self-financing through his enormous profits Morris did borrow some money from the public in 1926 and later shared some of Morris Motors' ownership with the public in 1936 when the new capital was used by Morris Motors to buy many of his other privately held businesses. Though it merged[note 1] into larger organisations in 1952, the Morris name remained in use until 1984, when British Leyland's Austin Rover Group decided to concentrate on the more popular Austin brand. Part of Morris's manufacturing complex at Cowley, Oxford is now BMW Group's Plant Oxford, headquarters of the MINI marque. A factory was opened in 1913 at former Oxford Military College at Cowley, Oxford, United Kingdom where Morris's first car, the 2-seat Morris Oxford "Bullnose" was assembled. Nearly all the major components were bought in. In 1914 a coupé and van were added to the line-up, but the Bullnose chassis was too short and the 1018 cc engine too small to make a much-needed 4-seat version of the car. White and Poppe, who made the engine, were unable to supply the volume of units that Morris required, so Morris turned to Continental of Detroit, Michigan for the supply of a 1548 cc engine. Gearboxes and axles were also sourced in the US. After the war the Continental engine was no longer available so Morris arranged for Hotchkiss of France to make a near copy in their Coventry factory. This was used to power new versions of the basic Cowley and more up-market Morris Oxford cars. The small car market was entered in 1928 with the Leonard Lord-designed Morris Minor, using an 847 cc engine from Morris's newly acquired Wolseley Motors. Lord had been sent there to modernise the works and Wolseley's products. The Minor was to provide the base for the MG Midgets. This timely spread into the small car market helped Morris through the economic depression of the 1930s. At the 1934 London Motor Show the Minor was replaced by the Morris Eight, a direct response to the Ford Model Y and, though Leonard Lord's handiwork, heavily based on it. In 1932 W R Morris appointed Lord Managing Director of Morris Motors Limited and Lord swept through the Morris works, updating the production methods, introducing a proper moving assembly line and creating Europe's largest integrated car plant. But Morris and Lord fell out, and after 15 years Lord left in 1936—threatening to "take Cowley apart brick by brick". Lord moved to Austin and they were to meet again in BMC—Morris, as Lord Nuffield, its first chairman. Lord succeeded him. As of 1 July 1935 Morris Motors acquired from W R Morris, now Lord Nuffield, in exchange for a further issue of ordinary shares to him, the car manufacturing businesses of Wolseley Motors Limited and The MG Car Company Limited. A separate private company, Wolseley Aero Engines Limited, was then formed to continue the development of his aviation interests. In 1936 Lord Nuffield sold Morris Commercial Cars Limited, his commercial vehicle enterprise, to Morris Motors. In 1938 William Morris, Baron Nuffield was raised to Viscount Nuffield. The same year he transferred his newly acquired Riley car business to Morris Motors Limited for £100. 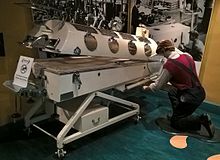 Visiting London in 1938 during a polio epidemic Lord Nuffield saw a Both Iron Lung in use. He commissioned an improved design which could be produced using the techniques of car assembly and arranged production of approximately 1700 machines at the Cowley works, which he donated to hospitals throughout all parts of Britain and the British Empire. Both-Nuffield respirators were able to be produced by the thousand at about one-thirteenth the cost of the American design. In the summer of 1938 Morris agreed to build equip and manage at government expense a huge new factory at Castle Bromwich specifically to manufacture Supermarine Spitfires. Nuffield's management failed, no Spitfires were delivered and from 1941 the plant had to be run by Vickers. After a major air raid damaged the Morris Bodies factory, the premises switched to the production of jerry cans, producing millions of these versatile containers for use during the rest of the war and following the ending of hostilities. The Cowley plant was turned over to aircraft repair and production of Tiger Moth pilot trainers, as well as "mine sinkers" based on a design produced at the same plant during the First World War. The Morris Minor was one of the most popular cars from Morris. Production restarted after the Second World War, with the pre-war Eight and Ten designs. In 1948 the Eight was replaced by what is probably the most famous Morris car, the Morris Minor designed by Alec Issigonis (who later went on to design the Mini) and reusing the small car name from 1928. The Ten was replaced by a new 1948 Morris Oxford MO, styled like a larger version of the Minor. A later Morris Oxford (the 1956 Morris Oxford III) was the basis for the design of India's Hindustan Ambassador, which continued in production until 2014. In 1966, BMC acquired Jaguar to create British Motor Holdings (BMH), which subsequently merged with Leyland Motors in 1968 to form the British Leyland Motor Corporation (BLMC), and subsequently, in 1975, the nationalised British Leyland Limited (BL). The Cowley complex remained the second largest single facility in the BL empire (after Longbridge), but BL's history was a turbulent one – BMC was close to financial ruin, and the newly installed Leyland management failed to turn its fortunes around. With the replacement for the Morris Marina and Leyland Princess being delayed into the 1980s, the Marina was restyled in 1980 to become the Morris Ital, while the Princess was restyled for 1982 to become the Austin Ambassador. British Leyland later confirmed that the Morris brand would be discontinued on the all-new replacement for these two cars, which was finally launched in April 1984 as the Austin Montego. The Morris Ital (essentially a facelifted Marina) was the last Morris-badged passenger car, with production ending in the summer of 1984. The last Morris of all was a van variant of the Austin Metro, before the Morris brand was finally completely abandoned in 1987. 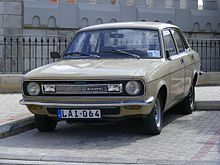 After much restructuring of BL in the late 1970s and early 1980s, the former Morris plant at Cowley and its sister site the former Pressed Steel plant were turned over to the production of Austin and Rover-badged vehicles. They continued to be used by BL's Austin Rover Group and its successor the Rover Group, which was eventually bought by BMW, and then by a management consortium, leading to the creation of MG Rover. None of the former Morris buildings now exist. British Aerospace sold the site in 1992; it was then demolished and replaced with the Oxford Business Park. The adjacent former Pressed Steel site (now known as Plant Oxford) is owned and operated by BMW, who use it to assemble the new MINI. A bullnose Morris, the car that made Morris's name and fortune. ^ a b Georgano, N. (2000). Beaulieu Encyclopedia of the Automobile. London: HMSO. ISBN 1-57958-293-1. ^ Wolseley And M.G. Companies.The Times, Friday, 14 June 1935; p. 20; Issue 47090. ^ Morris Motors Limited, Notice issued in compliance with ... The Times, Tuesday, 13 October 1936; p. 22; Issue 47504. ^ Langmore, Diane, ed. (2009). Australian Dictionary of Biography: Volume 17 1981-1990 A-K. Carlton, Victoria: Melbourne University Publishing. p. 129. ISBN 978-0522853827. ^ Healey, John (1998). "The Both Brothers and the 'Iron Lung'". South Australian Medical Heritage Society Inc. Retrieved 10 June 2016. ^ Castle Bromwich Retrieved: 9 February 2008. ^ a b "Sixty Years of Morris". Autocar. 138 (nbr 4022): 4–9. 28 June 1973. ^ Hillinger, Ellis (25 June 2000). "Morris Automotive Heraldry". Retrieved 11 January 2014.